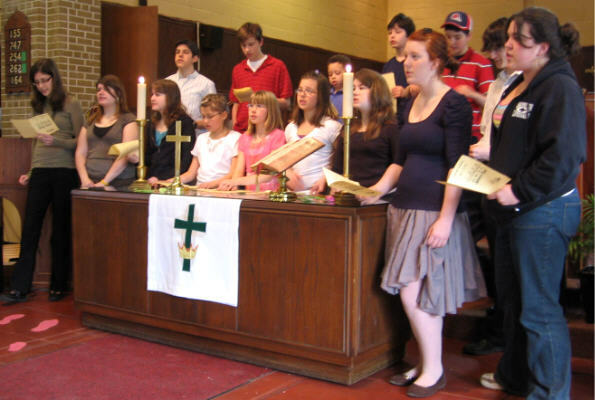 The 2007 Easter family service included participation by the youth choir and accompaniment by several young musicians: Alayna Roy on flute, Keith McKenzie on bass guitar, Justin Roy on trumpet, and Peter Maklan on trombone. 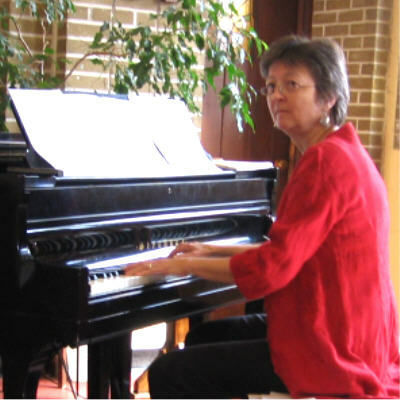 Ann Sutton for accompanying the youth group on the piano while Connie conducted. 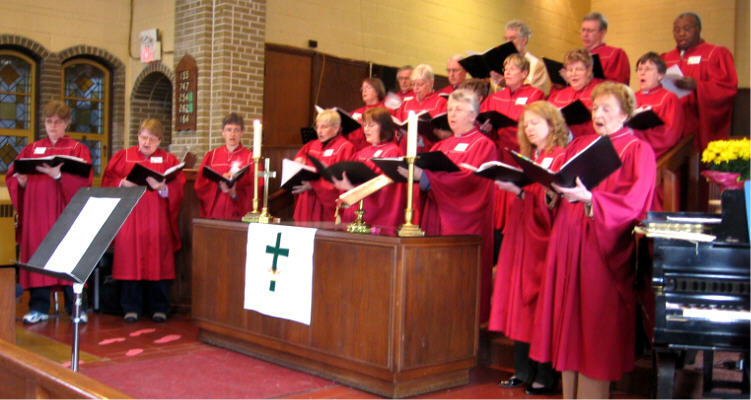 The service included dedication of the St. Andrew's Presbyterian stained glass windows, and after the service the window in Grace Chapel was re-dedicated. These events are recorded on the separate "stained glass" page. And, with no fanfare, Connie played the new organ for the first time (it will be dedicated at a concert / demo at a later date). All in all, a joyous and exciting celebration of the Resurrection. In loving memory of Bob French, from Lucy, Rodger, and Wendy. In memory of Harry Carlisle, from Virginia and family. Flute: Alayna Roy, Bass Guitar: Keith McKenzie, Trumpet: Justin Roy, Trombone: Peter Maklan. "Celebrate the Vision", from the musical of the same name, by A. Pote. from the steps with piano accompaniment, and from the choir pews with organ accompaniment. 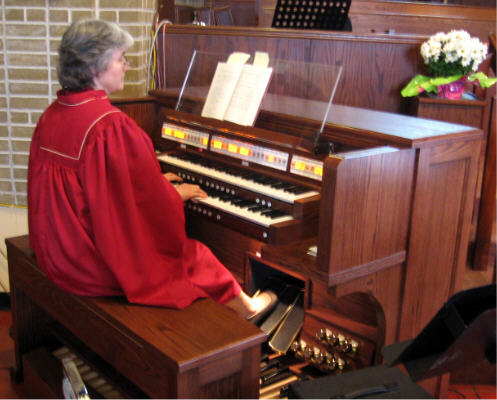 playing the new Phoenix organ (it was installed during Easter week). Some of the accompanists. 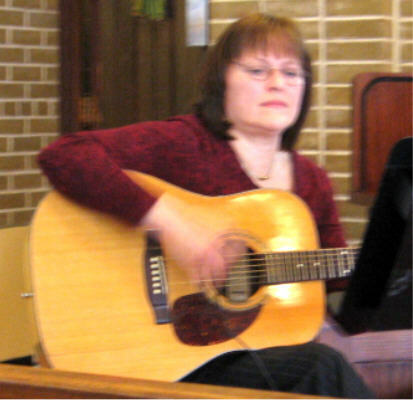 Leslie Field on guitar (she also teaches piano, plays the sax and sings, among her many talents). 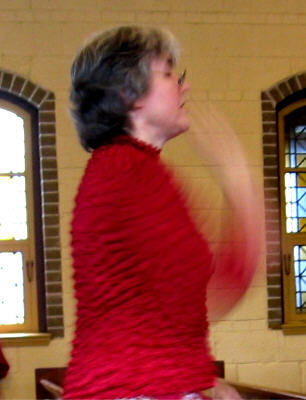 Ann Sutton accompanied the singers on piano while Connie directed. 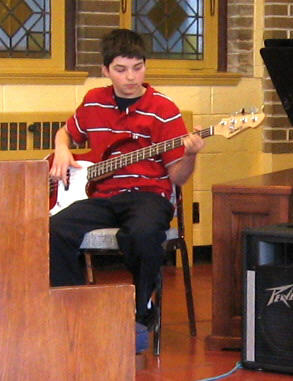 Keith McKenzie on bass guitar accompanying the youth choir in "Godspell".